Our baby shoes are made of soft and natural premium leather, take the same designing with many popular brands. There is an elastic and semi-hidden band around the ankle, making the shoes easy-on and stay-on well. This moccasins are very fashion and comfortable for pre-walkers, a necessary shoes for the crawler that just start to walk. Please choose the size by the sole length, the age is just for reference. 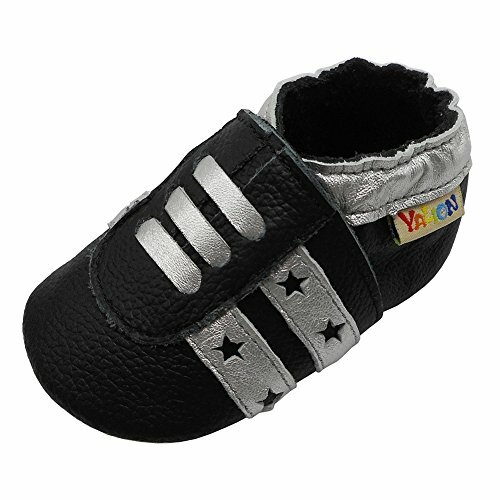 Great shoes for new toddler, elastic closure and brushed leather sole keep shoes easily put on and stay on well baby feet, non slip off. The moccasins work perfectly for pre-walkers, providing the necessary traction and excellent support from crawling to walking and even running. The soft and thin leather sole make baby move easily, protecting the soft skin from the dirty and dangerous playground surface. Please clean the shoes with damp cloth, not machine. Size attention: As baby feet are very soft, they are growing very fast, and need some room to grow naturally, it's better to choose a little bigger than exact size. And please choose the size by the sole length, not the age. If you have any questions about this product by Yalion, contact us by completing and submitting the form below. If you are looking for a specif part number, please include it with your message.